The Indian economy and stock markets may have gone through a choppy year but investment bankers had a busy 2015 as private equity and strategic acquirers signed a deal every three-and-a-half hours and the primary market window opened a tad wider. Preliminary data collated by VCCEdge, the research platform of VCCircle, show that 2015 recorded the most number of deals ever across both private investment (PE, VC and angel investments) and mergers and acquisitions (M&A). While the number of private capital deals spiked to 1,465, M&A deals totaled 938. In the PE segment (excluding VC deals), where we captured advisory work related to PE transactions across sectors as also deals involving the public equities market by PE-style private investors, EY (formerly Ernst & Young) topped the chart in terms of the number of transactions although the number of deals dropped by two to seven. o3 Capital was at No. 2 as it entered the top-five list with six deals. 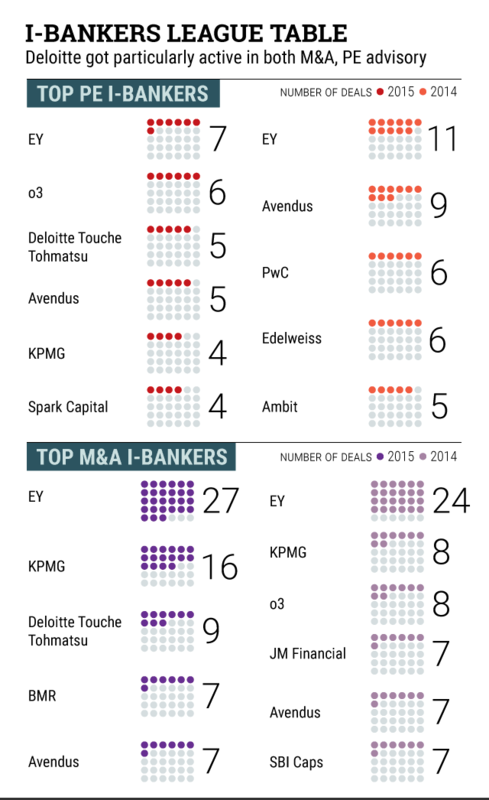 Deloitte Touche Tohmatsu and KPMG also entered the top-five chart while PwC and Edelweiss slipped out. Avendus also slipped in the rankings though it remained in the list. In terms of the announced value of PE deals for which the banks provided advisory services, the top charts present a different picture. Only Avendus and EY figure in the top charts. The list is dominated by Morgan Stanley and Arpwood Capital, firms that were engaged in advisory work related to the top PE deal of the year where Centerbridge bought out Senvion from Suzlon. The other investment bank who nudged in was Investec due to work related to renewable energy deals involving Greenko (GIC investment) and Ind-Barath (investment by Macquarie Infra Fund). Looking at the advisory work for all private investment deals (including angel/seed and VC deals) Avendus, which has been particularly active in prominent VC deals, topped the chart. It was followed by a small I-bank, Unitus, in terms of the number of deals advised. But to be fair, most of its advisory work involved early-stage deals of the group's VC unit Unitus Seed Fund. o3, EY and Masterkey round up the top-five list. In terms of the value of private transactions, Avendus pipped Morgan Stanley and Arpwood. EY and Deloitte Touche Tohmatsu also figure in the list. In the M&A advisory space, the top two slots remained with the same firms but KPMG bankers advised twice the number of acquisitions to bridge the gap with EY. Deloitte entered the top M&A advisory chart by volume along with BMR. In terms of the value of M&As advised, only EY figured in the top chart along with Citigroup, Credit Suisse, Kotak Mahindra Capital and Evercore. *The article and the infographic have been modified to reflect updated rankings.